The Red Cottage is a modern house in rural style for a family with up to 3 children. Made of advanced materials with windows and brick-built chimney, it provides best energy efficiency and a comfortable home which contributes to an excellent quality of life for its inhabitants. Yes I think there is a difference between what the code considers a better building, and what a description about it in real world is. I myself am always interested in what technically something means. I understand there could be someone less interested in numbers and more interested in the story. I think it’s best when you do what you did which is both – put some story, and also put what that means in game technical terms. How do you like it so? I feel as an estate agent selling this cottage but not sure with my English.^^ In current version it’s still counted as wooden house with high risk to catch fire. I would rework this aspect over all buildings in next version. In what way does this provide better quality of life? It seems to be the same as Ibiza. Never mind, I see in another page that the red cottage or “modern” building provides “health”. Maybe that could be indicated on this page? I made a line here for happiness to be more clear. Maybe “quality of life” is not the best term for what I mean but it at least catches it better than “health” which is just the technical name in source code, originally from vanilla hospital where it was taken away. More warmth with clay tiles than wooden roof on izbas sounds not realistic. I think people used tiles mainly because it looks better (what I also mean with quality) and because it’s more durable over long time while wooden roofs decay. 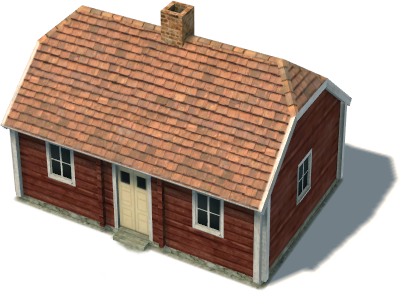 Also and this could be added in game because it does not catch fire as dry wooden shingles do.